Tennisclub IJburg and MVRDV announce that permission has been granted to start construction of The Couch, a new club house for the young tennis club, which was founded in 2010 on a new artificial island in the east of Amsterdam. The roof of the 322m2 club house, designed by MVRDV, is folded upwards and downwards to act as an informal spectator tribune for the club. Construction will start this month, with completion expected before summer 2014. The club house is a long open volume with services on either side such as dressing rooms, a kitchen, storage and toilets. The main space is multifunctional, so it can be used for the club’s many events. The roof dips down towards the south side and is raised towards the north until a height of seven metres, creating an informal tribune for the club. This ‘Couch’ can seat up to 200 spectators. The wide glass front to the north side allows extensive natural lighting and provides a view out over the waters of the IJ-lake. Inside the club house, the concrete construction is clad with fsc-certified wood, with the outside fully sealed with an epdm polymer hotspray in the same colour and texture as the clay tennis courts. The reduced glass surface to the south helps to cool the building. The thermal mass characteristics of the materialisation in concrete and wood are used to reach a high degree of energy efficiency. It will be heated with district heating made efficient by a heat exchange system. In summer there will be natural ventilation, adding to the ambitious sustainable profile of the structure. 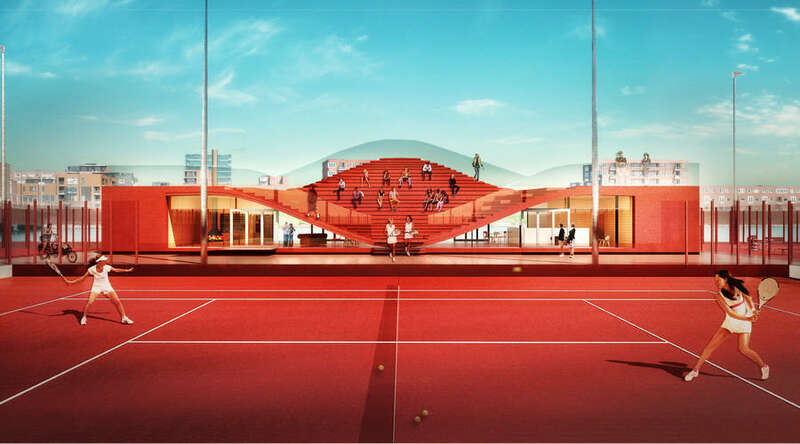 Tennisclub IJburg is located on a manmade island in the East of Amsterdam and opened in 2010. The tennis club, currently with 1100 members, has 10 clay courts and a tennis school. The new club house will be the centre of the club’s activities.